Spring has come to New England and so hope springs eternal, especially in an election year when gas prices are over the top, highways are falling apart and gridlocked and the environment and infrastructure are coming out of the political closet. 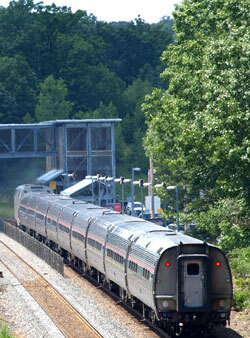 But then the cold breezes that blow through all too often until late June bring us back to reality, and the reality is that if passenger railroading is growing at the state and local level in many parts of the country (including in New England), too many Amtrak regional and long-distance routes have a long, long way to go. A case in point is Central Massachusetts, where I live and enjoy the woods, ponds, culture and creative energy of so many people who live in a prosperous and growing area. 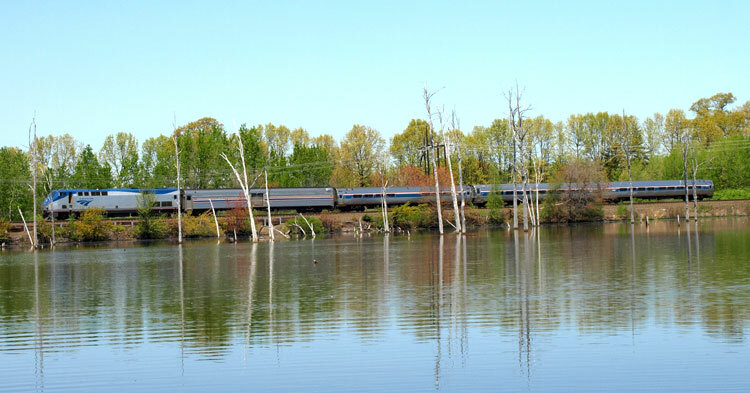 CSX has a stranglehold on our commuter service and main east-west line and all Amtrak has left us is the all-coach connect section of the Lake Shore Limited, photographed on May 14, 2008, from my canoe on Mill Pond in Westborough on its way west. 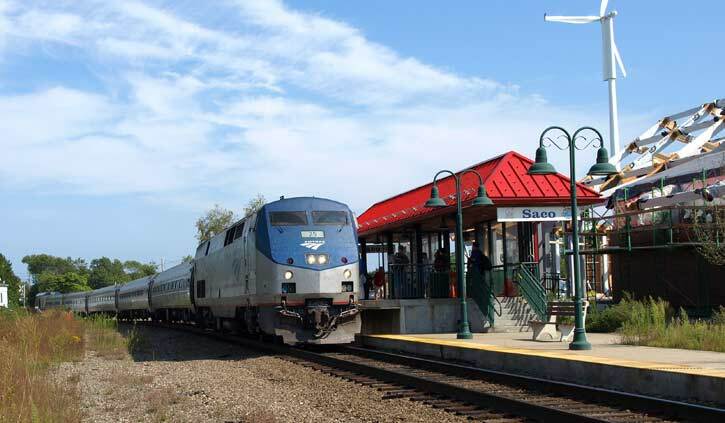 No effort has been made to help us get to New York and south -- the Lake Shore does not have a connection on the busy Springfield Line to New Haven and New York -- and most of the time the eastbound train arrives in Worcester and Boston in the dead of the night. 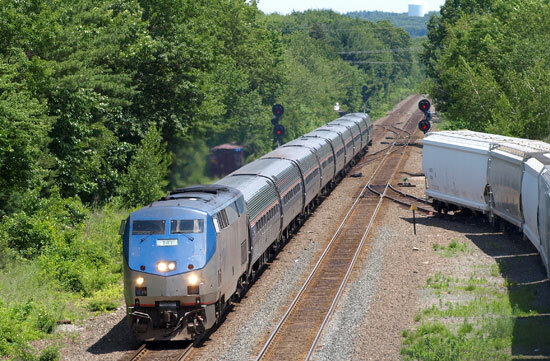 To add insult to injury, Amtrak is closing its main Boston-New York line for maintenance in mid-June and will be putting but one puny connection through here (not stopping of course) for passengers who don't want to fly or take one of the many new bus services we have available. One wonders if the politicians can be moved to support rail if rail doesn't support rail. Camera: Olympus 510 dslr with Olympus ZD 14-42 zoom lens. It's a beautiful Wednesday, June 25, 2008, in Central Massachusetts and here's Amtrak #1137 on its way through Westborough in CSX/MBTA territory on its way to New Haven, and New York, one of three trains in each direction to replace shoreline Acela and regional service due to repairs on the Thames River bridge in Connecticut. Originally, Amtrak had the bright idea to not provide any alternative rail service on the Inland route, but after frustrating delays in its repair schedule and a mighty wind of complaints from regional governors and the National Association of Railroad Passengers, it decided to offer service which hopefully cut into the revenues of the air shuttles and Chinese bus companies which ply the route. It's probably too much to ask that Amtrak give our growing and prosperous part of the country a way to get to New York and Washington by train, but at least public pressure got them to step up to this bar with a pretty impressive consist. Olympus E-510 dslr, Olympus 40-150 zoom lens. Too often when I think of Amtrak I think of Alberta Hunter's great album Amtrak Blues. Underfunding, diner-lounges on wonderful long distance trains, too much mismanagement over the years, no new equipment since the mid-90s, horrific Administration support in the face of an energy crises we saw coming years ago, miserable engineering on Acela and the NE Corridor and on it goes. But then I think of the Downeaster, the magnificent work of TrainRiders Northeast, the muscle getting put into new stations and trains (now five daily round trips) on the route and I cheer up. No more Blues. These two photos were taken on Friday, August 29, 2008 in Old Orchard Beach, Maine, and Saco, Maine. Northbound #683 is seen through my telephoto on its way to Portland from Boston. A few minutes earlier a southbound train picked up a large number of passengers. As I hung around the station I heard a lot of happy talk about 'trains being back', about getting around Labor Day weekend traffic and other good things. Down the line in Saco, we caught #686 arriving from Portland. In the background you can see the new transportation center that features 'green' features (note the windmill) and should be open late this year. 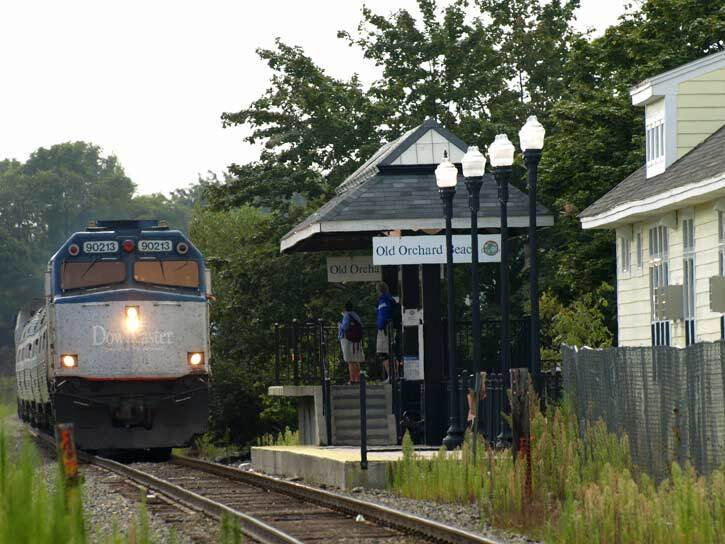 Maine is going full bore on passenger rail with plans well under way to extend service to Brunswick and, hopefully, beyond. Much to cheer about --- and, we have a vice-presidential candidate who rides Amtrak daily, and whose son is on its Board of Directors. Maybe we'll get to chase the Blues big time! No traditional and bucolic Happy Holidays train pic this year. Instead, we include a photo that holds a lot of hope for the New Year. It's an Amtrak California Capitol Corridor train on its way through Rodeo from Sacramento to San Jose on Saturday, November 29, 2008. Think about it. In the background a wheezing old oil refinery, cranking out product for gas guzzlers and the hordes of cars that have plugged up Bay Area freeways. In the foreground a bit of the increasingly clean San Francisco Bay. In the middle, a very attractive and popular train that bridges industrial and environmental ages and simply begs for more investment in equipment and people. Our hope comes from a double shock to our system: the election of a president who seems to know what he is talking about when he promotes infrastructure development that includes rail transportation, and a heavy recessionary hit that may be blunted by actual investment by national and state governments in infrastructure. While we all know people who have been hurt by the obscene policies that have put us in our current dilemma, we prefer to see the cup as half full. If Amtrak could hang in there through thick and thin, lets hope we all can. So HAPPY HOLIDAYS and NEW YEAR from your friends at Friends of Amtrak. Camera: Olympus 510 dslr with Oly 40-150 zoom lens. Changes last made on: December 6, 2008.